In this post, I want to talk about the history, how Dalai became the enemy of Chinese government and the human rights of Tibet, when it was governed by Dalai Lama during 1935-1959. In fact, Dalai Lama is a religious title of privilege in Tibetan Buddhism (many Tibetans in exile call Dalai as their Holiness). After the former Dalai Lama died, Buddhism monks have to select a little boy as the successor. The new Dalai Lama should be approved by the central Chinese government. Today, the well-known Dalai Lama actually is the 14th Dalai Lama, who was born in Qinghai Province, China, but not in Tibet. The appointment was approved by central government in 1935 when the China mainland was still governed by KuoMinTang. In 1949, the Communist party defeated KuoMinTang in the civil war, and communist army entered Tibet in 1950. At first, Dalai supported China Communist Party(CCP), because Communist party promised that they tentatively did not have a plan to abolish Tibetan Slavery. At that time, Tibet was the last area that slavery is a part of regional law. In 1959, Dalai thought that CCP was sure to abolish the slavery, sooner or later, therefore he waged a military coup. The result is that Dalai’s army was defeated by People’s Liberal Army(PLA), and Dalai with his supporters escaped to India. Chinese Tibetan government decided to abolish the slavery, although Tibetan slave-owners strongly disagree. After what the Chinese government called ‘Democratic Reform’, the slavery was abolished, however, many slaveowners escaped to India and became the enemies of Chinese government. Those slaveowners and their families formed the group of Tibetan in exile, and most of them are living in India, Nepal and many western countries as refugees. The following pictures are released from archives, which reflects the real life of ordinary Tibetan people under the government of Dalai. 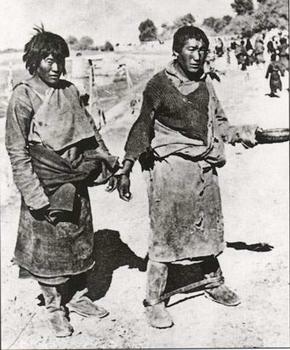 The first picture shows that two Tibetans as slaves. Theire hands and feet are locked together by Tibetan slaveowners in case of escape. Do you know what these are? These are Tibetan people’s skin! Dalai Lama used human skin to execute some Buddhism ceremony. The slaveoweners killed their slaves and peeled their skins. 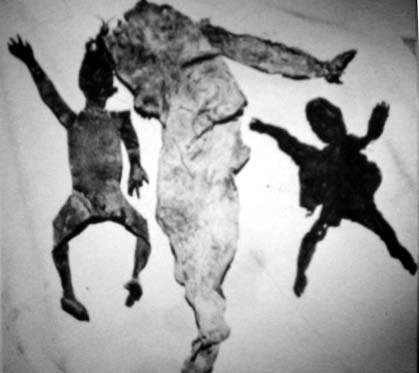 In this picture, obviously the left and the right are skins of children, and the middle belongs to an adult slave. The slaveoweners are willing to provide Dalai with human skins, because they believe they will be blessed by Dalai according to the Tibetan Buddhism. The third picture shows a slave whose arms were cutted off. When Dalai governed Tibet, human bones were made into religious instruments. 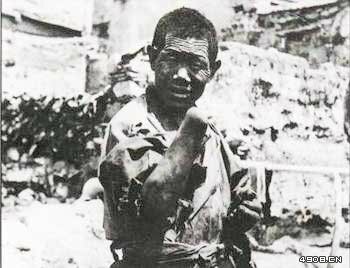 The most cruel thing is that the slaveowners cut arms and legs from Tibetan slaves who are alive. This little girl starved to death. The slaveowners have sufficient foods and they intentionally let the female slave starve to death, because they want to use her heart, liver and other organs as sarcrifice. Besides, her head will be made into a container of drinks. Do you know how old the female slave were when this picture was taken? Most of you maybe think she was beyond 60 years old. 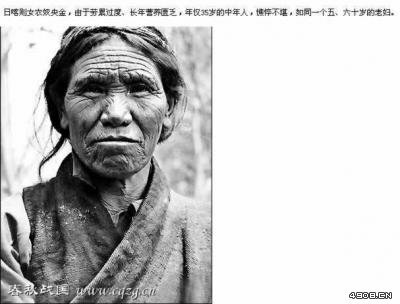 In fact, this female slave, Jinyang, was 35 years old when the picture was taken. No doubt, it is the slavery life that lead this young woman to such terrible state. When I was editing this entry, I really feel sad for the tragedy of Tibetan people under the government of Dalai. I still have many horrible pictures, and I will release them later. Do you want to let the Tibetan be under the government of Dalai again? Go to You Tube and type organ harvest in China. you will see your own back yard. your back ground pictures and news are latest. some survivers are still practicing and believe on their faith. and you beleive to your government, who keeps you in dark. Minute later some police man will be knocking your door. After you check your back yard then get back to me..
May your inner mind be clean. These pictures were taken in 1950s, when Dalai Lama was the actual governor of Tibet. I don’t know how you can draw a conclusion that these pictures are 19th century’s. Here I discuss the human rights of Tibet, according to the facts. I drew all the conclusions from the history record. 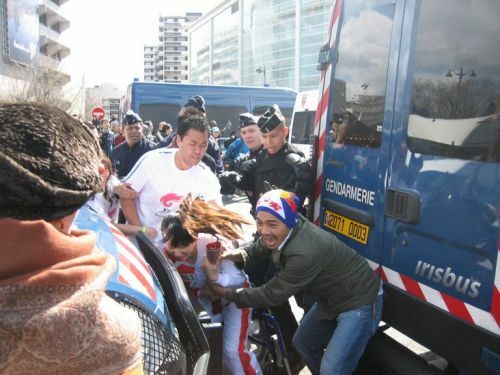 I do not discuss the recent riot in Lhasa. You never catch my point. I guess that you’ve never been to China, you don’t know the real fact at all. Would you please take account into how old was current Dalai in 1950’s? If you would claim this is all caused by Dalai, that would mean a 15~20 year old dalai could have chang the whole culture in a blink? After the communist party take over, they killed more then you can imagine, but can you question your government what’s going on? Then in 60s you start to destory all religions and ancient artifacts. People dies maybe 100 times more than those stupid slave owners in Tibet. Free Tibet….and free yourself from the brain-washing education. May I ask you how old were those slave-owners in 1950s? Dalai Lama’s current supporters, those officials of Tibet government in exile, are the children and grandchildren of those slave-owners. Are you qualified to represent Tibetan people? You know that 95% Tibetans were serfs before you guys went away from Tibet. Please check UN’s demographics, tell me how many Tibet people were killed by Communism party, thanks. Fact and Truth – CLEARLY you are chinese. Im smart huh?!! but it is probably your lack of english skills that gave it away. and the face that you are a dumb ignorant brainwashed fool. YOUR government not only murdered the tibetans but your own people. open a history book NOT WRITTEN by the chinese and maybe you can shed some of that ignotance of yours. you poor brainwashed people. You need to look up the definition of hypocrite in your little chinese english dictionary. Tibet may have a very dark history but how can you criticize when china did the SAME TO ITS OWN PEOPLE , on a LARGER scale. In 2008 China still has no clue what human rights are and beats the tibetans on the street (YES WE DO KNOW ABOUT THAT…see we have smart under cover reporters who filmed quite a few incidents of the chinese military BEATING tibetans in tibet (what you call china) but you dont see this beacause the CHinese govt controls your media. SO – here’s a thought. Instead of sounding like another ignorant brainwashed chinese (yes, that is what the enlightened world thinks of you poor people) PICK UP A BOOK NOT WRITTEN BY THE CHINESE. maybe then people will listen to you. P.S. – idiot. did your govt tell you that poor lady was 35. idiot. ASK A DOCTOR. ASK A SCIENTIST – or better yet open your eyes and use your brain for once. now if you really still think she was “35” then forget everything i have said. you are hopeless. ignorance is bliss though, isnt it…. lol this has got to be one of the more pathetic sites iv seen. Where are your sources? The Chinese government that claimed Tibet was always part of China? Now it was seperate and ruled by an evil Dalai Llama who is a devout Bhudist and won the nobel peace prize??? The very same government that killed millions of Tibetans and is responsible for the situation in Darfur? The same government who killed hundred of innoscent students in their very own Tian’anmen square and claimed very few casualties? Please, whoever you are, Whether you are working for the chinses government or a patriotic Chinese… dont listen to one side. Open you’re mind, you’re heart, and you’re soul. Follow you’re heart, people are dying. If the chinese government is so sure and they have all this evidence, then why can’t reporters enter the country and report freely? Why do tourist’s have to have thier video’s checked before leaving the country? WHy have many Europeans and americans been jailed for having recordings of human rights violations? What goes around comes back around… the more bull you put, the harder you will fall. It is only a matter of time. where are you credible sources? lol. Mojority of people leaving comments on this website believe that chinese people are brainwahsed by the chinese government. They never realize that they have been brainwahsed by their governments to think that all the facts known to them before they visited this website is the actual truth. Everytime someone mentions the truth that Dalai Lama has done some really bad stuff before,there is always someone else jumping up pointing their fingers and crying outloud ” you chinese, your government has killed a lot more poeple.” I just wanna say ” No one can use what the chinese government has done to justify Dalai lama’s disgraceful past. No one here is trying to convince other people how great the Chinese Government is. Sure the Chinese Government has done something they try to cover up just like other governments do. But the gist of this website is not to discuss how great or how bad the Chinese Government is. This is about Dalai Lama’s unspeakable ugly past!!!!!!!!! Don’t tell me that Dalai Lama’s pasat can be forgotten or forgiven just because someone esle has done sth worse than him. I certainly was interested in this account. All very new to me. But I know that evil exists everywhere. Maybe Tibet was the last place to abolish slavery. Britain (my country) had slaves, America, France and Africa. What would have happened if Tibet was still independent? Maybe slavery would eventually be abolished. Maybe International pressure would have made it so, maybe not yet. But the bottom line is a country has a right to its sovereignty. It has a right to follow it’s own path to individual freedoms and rights and democracy. This is another one of those sites promoted by those colonial powers. It is sheer propaganda. It is now the 21st Century and a new era where all of us should stand up to those colonial powers. All of us have a right to our independence! We must free Tibet! We must also free Hawaii! Maldives must also be returned to its rightful owner! Alaska must also be freed! Texas must also be returned to Mexico! All of us have our rights! We must not let the perpetrators succeed in their actions. From 2-3 years I am interested in tibetian budhism. What I saw here absolutely amazed me?! Because in budhism – compassion to all creatures is the most important thing. How had been all that be possible ? Because Tibetan Buddhism is a cult. 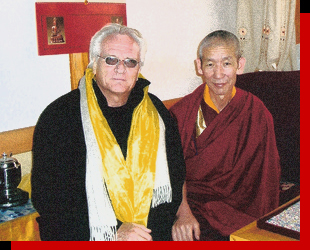 Tibetan Buddhism is fake Buddhism. And unfortunately, too many people interested in Tibetan or Mahayana Buddhism. The Buddha never ever taught that f*ckin’ things. All evil things that appeard from Tibetan Buddhism is came from Tibetan culture and mixed with Mahayana Buddhism. Be free thinker to find out the real Buddhism in this world! I had no idea how to approach this beoreo-nfw I’m locked and loaded. To № 15: What do you mean “evil” things ? I am afraid, I dont understand – what is the role of tibetian budhism for the misfortunes of the refugees. Is that right – that the chinees invade in Tibet in 1959 with the human mission to free people from slavery – and then used this for to conquer Tibet ? Is this the real face of Tibetian budhism in the past? And what about T. budhism today ? Congratulate to you that you have perfect English.U S government is the biggest terrorist in the world. Can anyone name another another country which so many people of foreign countries? Congratulate to you that you have perfect English.U S government is the biggest terrorist in the world. Can anyone name another another country which kills so many people of foreign countries? Everything has it’s black side and white side. For Dalai Lama, what he is now I cannot say, but what he did was unquestionably horrible. And I think no matter it is the Chinese government or the Western Media, they should both let people know the two sides of politicians. Ever since the ccp took control of tibet in 1959, the population has more than doubled from about 1.2 million people to 2.8 million people and the life expectancy has increased from 36 years old to 65 years old so obviously the claims that they slaughtered more than a million tibetan monks is absolute rubbish. The tibetans have many special benefits including free education, free medicare, and the one child policy does not apply to them. Apart from that, it is easier for them to get into universities and schools as the borderline scores are lower for tibetans. Many like to talk about how the CCP do not allow tibetans to practice the tibetan form of buddhism. However, tibet has about 4 times the number of monks that thailand-another buddhist country-has and they are provided by the taxes that the chinese people pay. 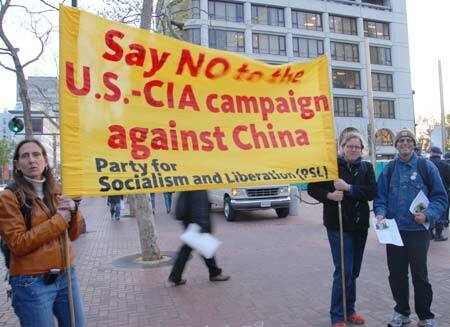 For all those westerners who like to hear that China is bad, please get a life. For all your talks about the CCP mistreating its own people, China will be the most powerful country in the world in a few decades and NOTHING can stop its rise, least of all some slandering foreigners.